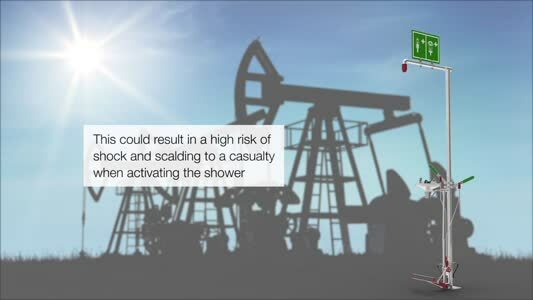 Hughes Safety Showers are Europe’s largest manufacturer of emergency safety showers and eye/face wash equipment for all industries and environments, whatever the climate or local hazard. The complexity and diversity of modern industry has created a wide range of hazards. Protecting the safety of your workforce is paramount. 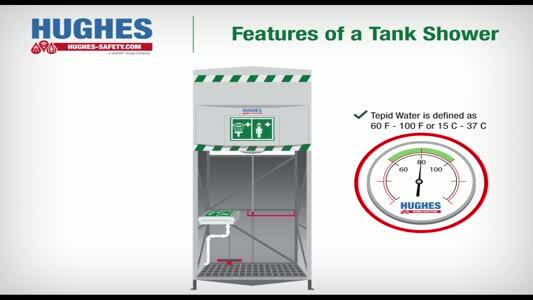 Hughes can offer a range of safety showers for indoors; outdoors, even in freezing conditions; mobile units to act as a secondary measure or to supplement plumbed in safety showers; tank showers able to provide tepid water without a mains water supply and much more. We’re celebrating 50 years of manufacturing excellence in 2018, you’re in safe hands with Hughes Safety Showers. The range of Freeze-Protected Outdoor Emergency Safety Showers are for use in climates where there is a possibility of the water inside the shower freezing. These models not only provide effective health and safety measures, compliant to current legislation, but also preserve and prolong the lifetime use of costly PPE. Vital for standby use where no water supply is available, to supplement plumbed in models or when existing safety showers are undergoing maintenance. Intended for indoor use, these plumbed-in and self-contained (portable) models are engineered to be quick and easy to operate in an emergency. Intended for outdoor or indoor use in low temperatures and designed to be on standby to deliver tepid water for over 15 minutes. Whether you are considering equipment for responder, mass decontamination in an emergency or to train emergency response personnel, Hughes offer a range of products.